﻿This is my first attempt of royal icing. 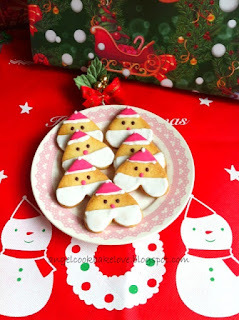 I made about 70pcs of decorated cookies, though it was tiring, I had fun and enjoyed doing it. 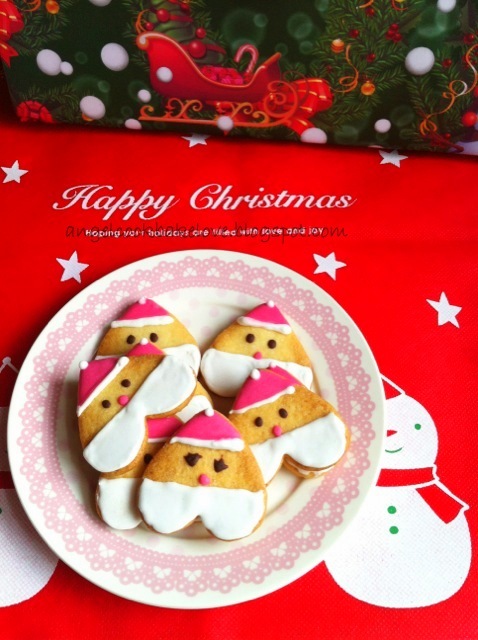 I tried to write down step-by-step detail to help beginners like me who would like to attend to this cookies design. I may be wrong because this is my first attempt, so please correct me if I am wrong in certain step. Thanks. Beat butter and sugar till pale and fluffy. Add eggs and vanilla extract, beat till well mixed. Sift in flour and fold in using a spatula then lightly knead to form soft dough. Wrap with cling wrap and refrigerate for 15 mins. 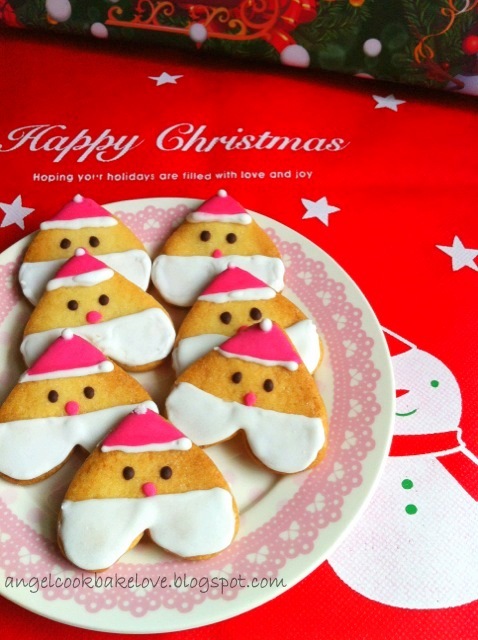 Roll out the dough (suggest to keep half portion in the fridge) and cut out using a heart shape cookie cutter. Lift up the cookie dough with a flat spatula and transfer to baking sheet carefully. 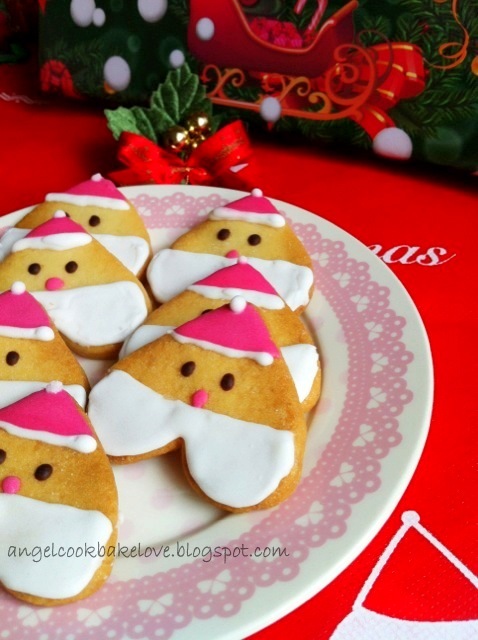 For the size of cookie cutter I use, this recipe yields 70+pcs. Bake in preheated oven (middle upper rack) at 170C for about 12 mins till cookies become firm (not brown), turn off the heat, keep cookies in oven and use remaining heat to bake the cookies till light brown. You need to monitor very closely especially the last 5 mins (I actually prefer mY cookies to be slightly brown than pale). Cool on wire rack completely before decorating. Beat egg white and vinegar/lemon juice till frothy, sift in icing sugar gradually and whisk to combine until reaching a thick yet runny consistency. The more icing sugar you add the thicker the icing will be. So you can adjust the consistency by increasing or reducing the icing sugar (I used about 220g of icing sugar). Cover the icing with clip wrap to prevent drying. 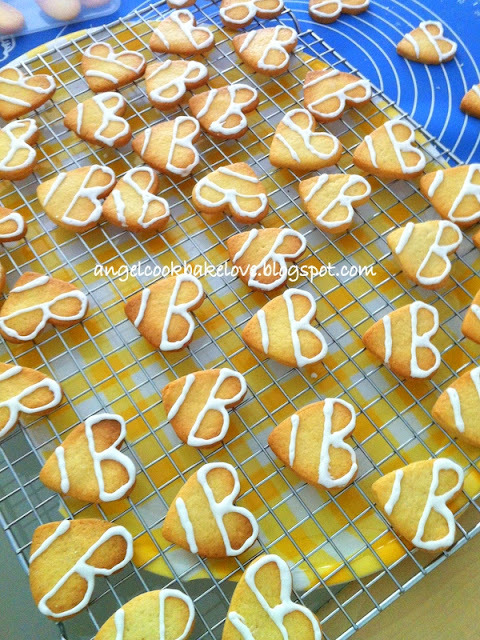 Fill in some white icing to piping bag with Wilton #2 nozzle; draw the outline (as shown in above picture). Complete all cookies before move on to step 2. Transfer some white icing into another bowl, add little water to make it runnier (as my icing is quite thick), carefully spoon icing on the “beard” area and use tooth pick to spread the icing. Complete all cookies before move on to step 3. Transfer some white icing into another bowl, add few drops of red colouring and mix well. 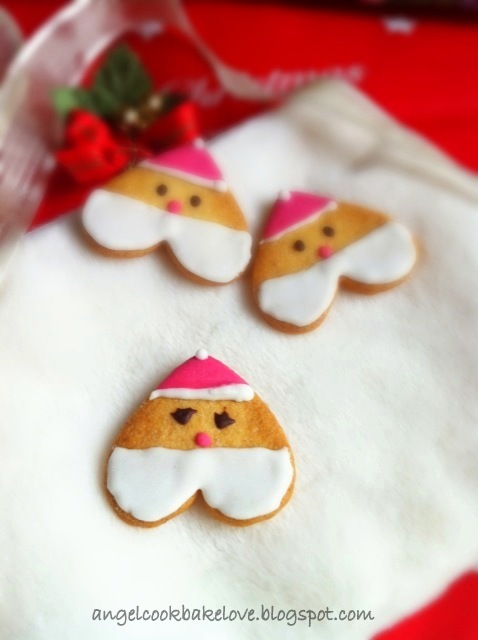 Use tooth pick to pick up the icing and add one dot to form the “nose” and fill up the “hat”. Complete all cookies before move on to step 4. Use the same icing in step 1, with Wilton #2 nozzle pipe one dot on the tip of the hat. Complete all cookies before move on to step 4. Transfer little white icing into another bowl, add little water and cocoa powder and mix well. Use tooth pick to pick up the icing and drop 2 dots on cookie to form the “eyes”. Complete all cookies. 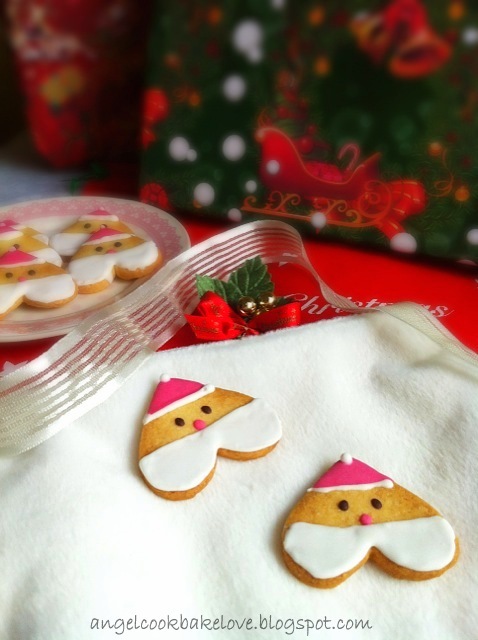 Santa Claus cookie is done! 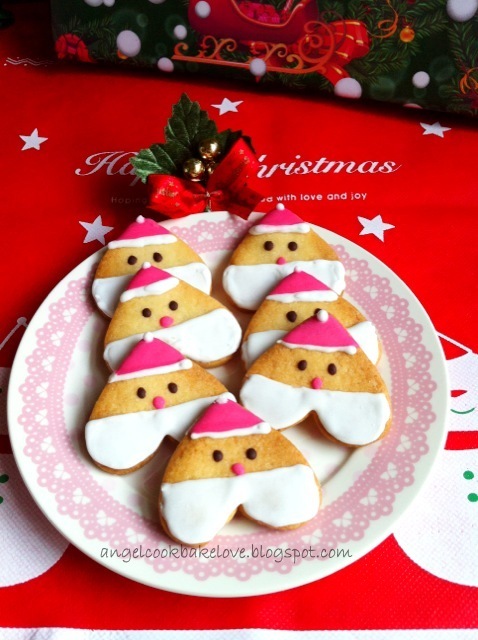 I am submitting this post to post to Aspiring Bakers #26 – Creative Christmas Motif Bakes! hosted by Alan of Travellingfoodies. I like all the lovely Santa Claus cookies' photos, please help me to decide which photo to submit to Aspiring Bakers. Please vote for your favourite photo. Thank you. XOXO. I like the first picture, very nice plated. I also like first photo. Proper angle with nice setup. so cute! 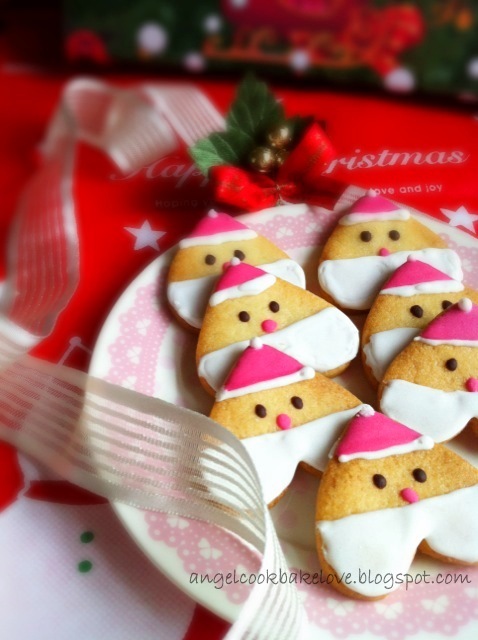 !merry christmas and happy new year! HAPPY NEW YEAR TO YOU AND YOUR FAMILY. HAVE A BLESSED 2013.